Are you sure you want to know? : Is this offensive, or is it just me? Apparently I'm a little late to the game....just in time for the Inauguration of our 44th President - all the way back in January - someone came out with the Obama Chiahead. Did I miss the Bush Chia Head? That is just creepy - I will never look at him the same way again! 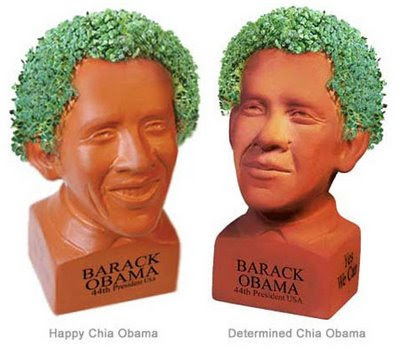 Chia epitomizes everything tacky. While it's not surprising that this company decided to do this, it's not quite the same honor as if a fine sculptor were to commemorate his likeness in bronze.